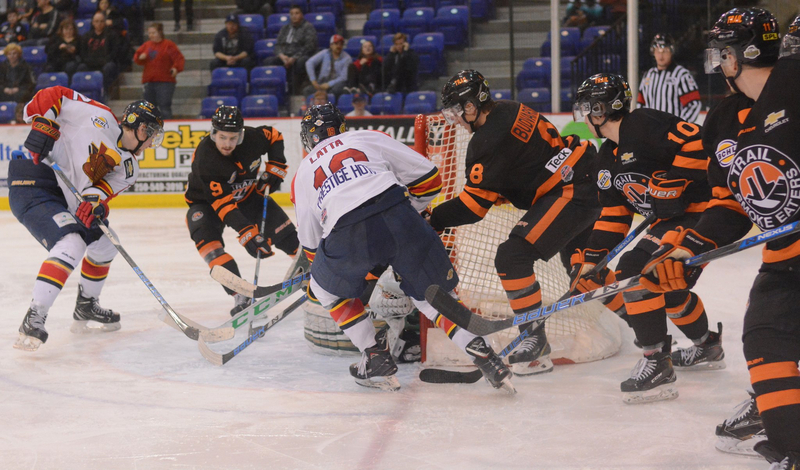 The Smoke Eaters were first on the scoreboard for the fifth time in the postseason as Braeden Tuck finished off a nice play and scored in his fourth straight game to give Trail a lead midway through the opening period. Carter Jones made a nice pass from the right boards to a streaking Tuck who tapped it in on his backhand for his 4th goal of the playoffs and a 1-0 Smoke Eaters lead at the 10:09 mark of the period. The period started to take a run of special teams play and it was the Vipers who took advantage of that with a pair of power play goals beginning at 16:01 with Teddy Wooding tipping in a shot. Wooding got a pass from the left-wing side from defender Carver Watson and deflected in the puck on the glove side of Smoke Eaters goaltender Donovan Buskey to tie the game at 1-1. Vernon added a late goal in the opening period to get their first lead of the game coming with just 18 seconds remaining in the period and came courtesy of another power play. Jack Judson took a right point shot that was deflected by Matt Kowalski in the right face-off circle and past the glove side of Buskey for a 2-1 Vipers lead heading into the dressing room. The Smoke Eaters fought back and scored three unanswered goals, beginning with a tying goal at the 14:48 mark of the middle stanza. Owen Ozar collected a loose puck after a scramble on the right side and had his shot slide through the glove side of Vipers goaltender Aidan Porter and hit the post before Trevor Zins banged in the puck for his 2nd goal of the playoffs and a 2-2 tie heading into the final regulation period. Trail continued to apply pressure in the 3rd period and earned their second lead of the game on a strong defensive play by Tuck that turned into a goal. The Smoke Eaters captain stripped a Viper of the puck inside of the offensive zone and set up Carter Jones with a pass on the glove side for his 3rd goal of the playoffs and a 3-2 lead coming at 6:24 mark of the 3rd frame. The depth of scoring continued for the Smoke Eaters as they took a two-goal lead midway through the 3rd period from an unlikely source of offence. Trail won a face-off in the offensive zone as Luke Gallagher passed to the left point for Kyle Budvarson who beat Porter with a shot through traffic for his 1st career BCHL playoff goal at the 9:29 mark for a 4-2 lead. The Vipers roared back late in regulation and scored twice in a span of 31 seconds to tie the game, beginning with a Connor Marritt deflection at the 18:54 mark to get Vernon within a goal. Marritt deflected a Michael Young point shot from the right side over the blocker side shoulder of Buskey to cut the deficit to 4-3 with just over a minute remaining. Vernon got Porter to bench again and found a way to get the puck through to even the score at 4-4 at the 19:25 mark of the period. Young got a pass from Judson at the top of the left circle and hit a one-time shot through the blocker side of Buskey to even the score and force overtime in Game #2. The overtime frame did not take long to decide a winner as just 12 seconds into the extra period, the Smoke Eaters earned a 2-0 series lead. Owen Ozar wound his way through center ice, cutting inside the blue line and let a shot go from just outside of the slot to beat Porter on the glove side for his 2nd goal of the playoffs and propel Trail to a 5-4 overtime win. Donovan Buskey stopped 26 of the 30 shots he faced in his 6th win of the playoffs while Aidan Porter turned aside 16 of the 21 shots thrown his way in his 3rd loss of the postseason. The Smoke Eaters head back home with a 2-0 series lead and look to continue their success on home ice in Game #3 of the Interior Division Semi Final against the Vernon Vipers. Puck drop is slated for 7:00 PM from the Trail Memorial Centre with tickets available for purchase at the Smoke Eaters Main Office as well as at the door ahead of the opening face-off.